Cyber Factory installs and maintains Grid-connected and Stand-alone Renewable energy systems. 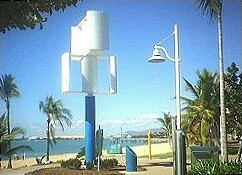 Vertical Axis Ropatec Wind Generators produce clean energy which can be used to power your energy needs or be grid-connected and "selling" (see note) electricity to the grid. Note: Consult your electricity supplier, limitations apply and may not yet be possible at present in your area. The Townsville State High School Ropatec has been up since 18/05/06 on a 10 meter unstayed tower. and is tied in with a solar pyramid to produce clean energy for the school's library.